Chlorination of naturally occurring phenols has taken place perpetually, but since the introduction of pentachlorophenol (PCP) as a commercial antiseptic in 1936, the worldwide production of chlorophenols has rapidly increased with an elevated environmental burden as a result. Today, chlorophenols (CP) are widespread in the environment. Even in the most remote natural environments, analyses have shown the presence of chlorophenols in both aquatic and terrestrial food chains. 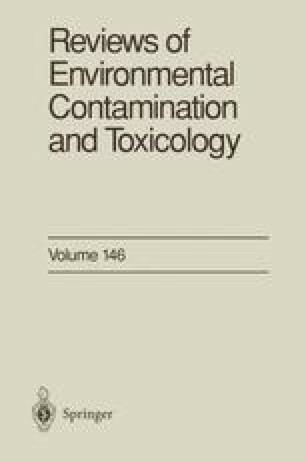 Previously reported reviews on chlorophenols have mainly focused on the aquatic environment or on the toxicological aspects of chlorophenols (e.g., Ahlborg and Thunberg 1980; Bevenue and Beckman 1967; WHO 1987, 1989) mainly due to the preponderance of information in these areas. However, partitioning models have shown that more than 95% of the load of pentachlorophenol is associated with the soil (Hattemer-Frey and Travis 1989; Shiu et al. 1994; Wild et al. 1992). This review is solely committed to the fate and ecotoxicological effects of chlorophenols in the terrestrial environment. After a short review of the fate and bioavailability of chlorophenols in soil, the major parts of this paper present ecotoxicological data [no-effect concentration/effect concentration (NOEC/EC) values] of chlorophenols relating to soil flora and fauna. The data were collected from laboratory and field experiments published in international papers. Finally, a short evaluation of the ecological risk of chlorophenols in the terrestrial environment and the risk assessment in a few countries are presented.